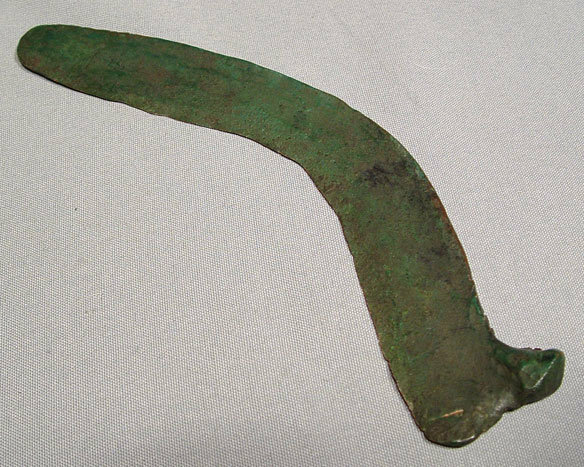 An Ancient Cast bronze Celtic Druid ritual sickle from the Hallstatt Culture, circa 800 -475 BC). The Hallstatt culture was the predominant Western and Central European culture during the local Bronze Age, and introduced the Iron Age. The Roman Author Pliny the Elder described the Celtic ritual gathering of mistletoe which was found growing on an oak tree. A Druid, dressed in white, cut the mistletoe using a sickle and allowed it to fall on to a white piece of cloth. This ritual took place on the 6th night after the new moon. From this account, we see that the Druids held some importance to the color white, and use of a sickle.